I found a bag of assorted crap. 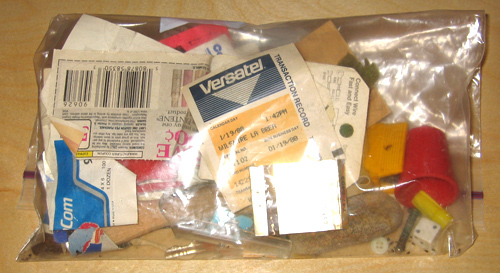 It's the sort of crap you toss in a junk drawer and when you move out of your house, you shove it into a bag because you don't have time to sort it out. It is such insignificant crap that you never bother to sort it out. So it sits around in a box, unseen for decades, until it becomes a little time capsule. I started thinking about this sort of crap when I heard that Andy Warhol used to store boxes of assorted crap in his archives. He'd throw random things into a box and periodically send them off to storage. After he died, the boxes were opened and cataloged. One of the boxes contained a lost script by Valerie Solanas, she shot Warhol because he lost it. Oh well. My bag of assorted crap is not as interesting as that. But since it is a collection of ephemera that has survived intact for so long, it deserves a closer examination. So I'm going to present photos and document every single item in the bag. I did this once before. I took photos of a box of my childhood toys. I got an email from Rudy Rucker, he said he had boxes like that in his basement but he never knew what to do with them, now you just blog it and toss it out. This is the unopened bag of crap. Click the link to see the rest of the photos. I can date this pile of crap exactly. There are several ATM receipts dated January 1988 from Los Angeles and June 1992 in San Francisco. Health insurance cards from before I moved to California in 1982. They were in a plastic sleeve that was in my wallet, I must have removed them when I got to LA and threw them in a drawer. Membership card from Trashy Lingerie dated 8/1/1986. I went there to buy a gift for my girlfriend Susie. But you couldn't enter the shop without an expensive membership which was refunded when you made a purchase. The card has a daub of Cadmium Yellow oil paint on it and is stained with oil. 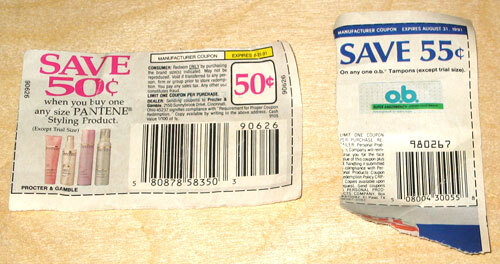 Coupons for women's hair products and tampons. 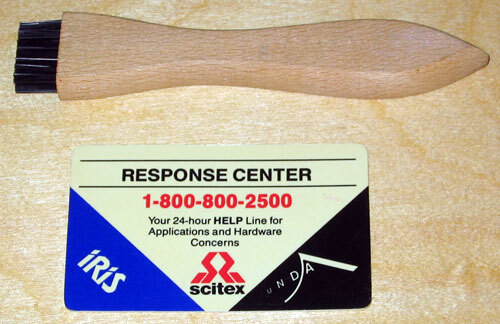 Scitex tech support card for the Iris inkjet printer and a cleaning brush. I used to operate one of the first Iris inkjet printers in the US. 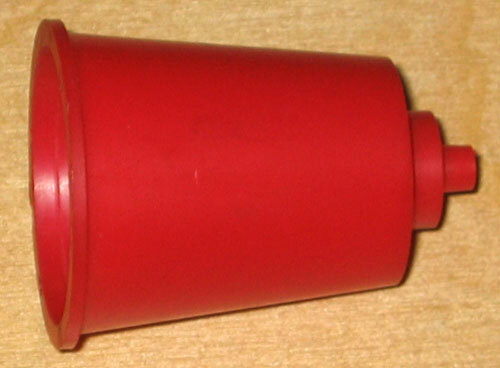 I frequently had to wash the printhead under water and scrub it with this brush, while inspecting it under under a powerful magnifier, to remove microscopic dust particles. Trunk key for my 1986 Taurus, spare gas cap key for my 1965 Plymouth Barracuda. 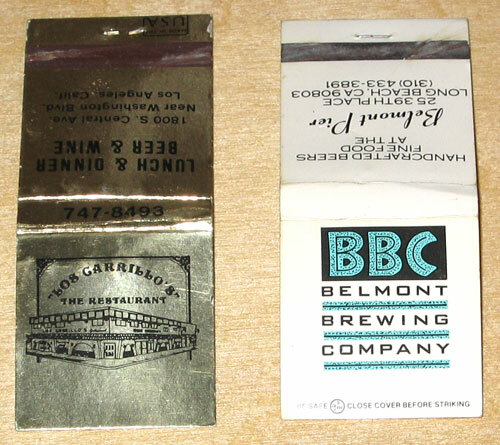 Matchbooks for Los Carrillo's and Belmont Brewing Company restaurants. I remember Los Carrillo's in downtown LA but I don't remember ever going to the BBC in Long Beach. Crumpled flyer for the underground nightclub READ that I was briefly associated with. 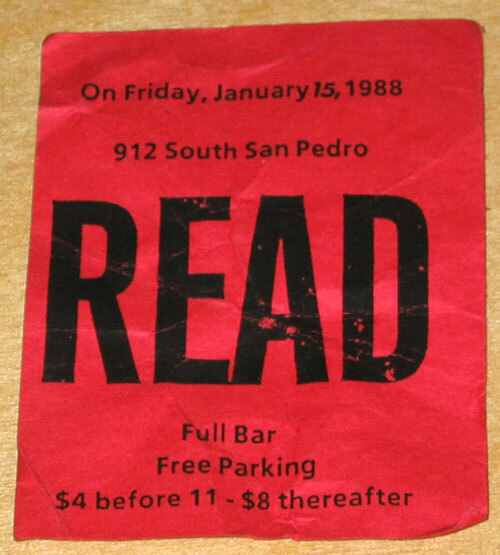 This was the only downtown LA nightclub with a weekly magazine and a reading room. The club went out of business after only a few weeks. Decorative sponges: Space Shuttle, comet, llama, and monkey. The sponges were compressed into little gelatin pill capsules, drop them in water and they expand. Empty bag for a stereogram viewer. Generic business card from ComputerLand Downtown LA with no name on it, and a card from Max Levine men's clothiers. When I worked at ComputerLand, employees were required to buy at least one new suit each quarter. My boss hosted quarterly events at Max Levine where we were all required to attend and buy a new suit if we had not done so already. Extra buttons. The white button was loose in this bag of crap. The suit button on the piece of blue cloth was in the envelope. This was from one of the suits I bought at Max Levine. 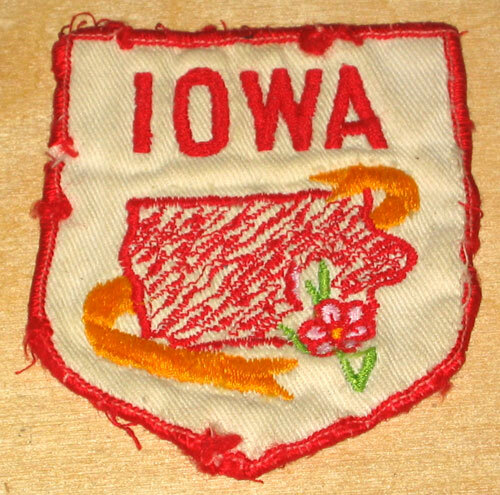 Ugly embroidered Iowa patch. I think my sister Janet found this on a cheap shirt in a thrift store. 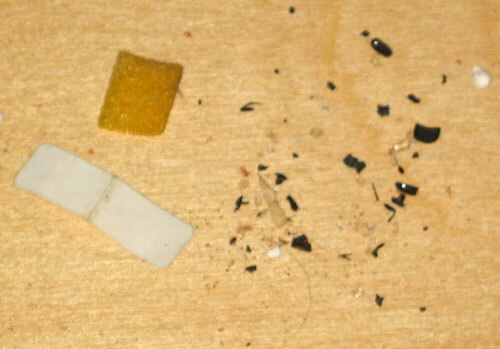 Rock and fragment of Stunt Glass. This type of fake glass is used for movie stunts because it breaks easily and won't cut you. I rented my art studio as a movie location, they replaced one of the windows with Stunt Glass and threw a stunt man through it. Then they put the real glass back when they were done. 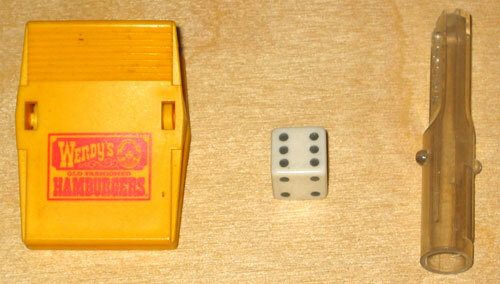 Plastic clip with Wendy's Hamburger's logo, dice, safety cap from X-Acto knife. 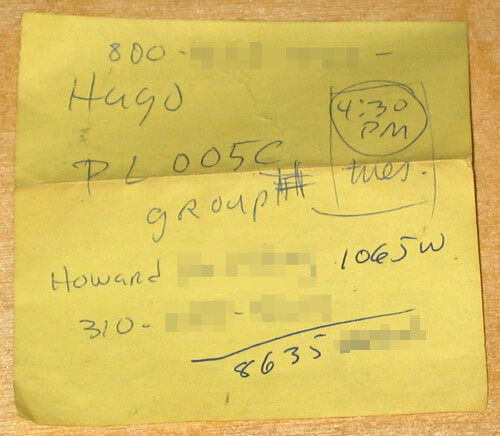 Post-It Notes with names, phone numbers and addresses. I believe that top note is the number of Harry Marks, the founder of TED. 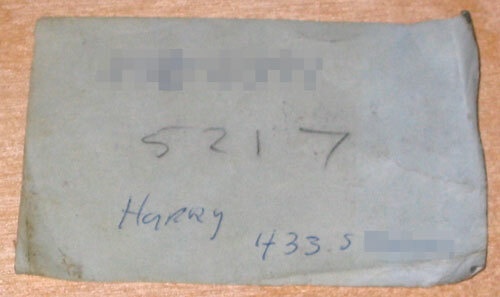 Label from a package of 4x6" notepads. 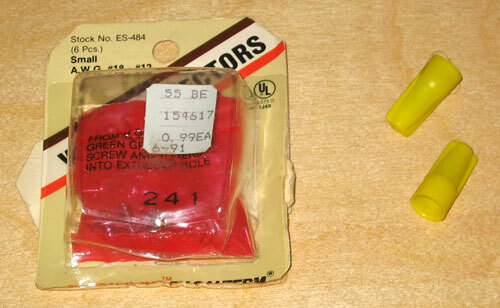 Cassete tape labels, unidentified plastic coated card with round corners. Canadian penny, US penny and nickel, red pricetag labeled "STELLAR HDWE. 59¢," 22¢ postage stamp, bread bag clip. Screw, bolt, nail. I recognize the screw, it's from a new office chair I bought for my studio. The screws kept falling out and the seat would come loose from the base. Wiring connectors for making unsafe wiring connections. 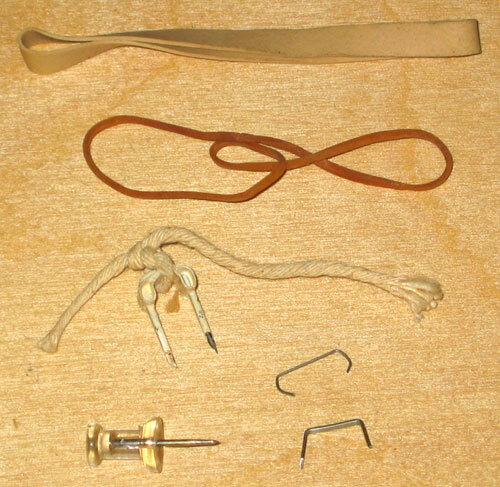 Two rubber bands, a cabling staple with white string tied to it, a transparent push pin, and two staples. The rubber bands are so old they have become brittle. Dirt and detritus from the bottom of the bag. I noticed the photo was blurry, so I took it again. It was still blurry. I was going to try a third time, then I thought, "what the hell am I doing? This is dirt. This project is done." I am sure I have other bags of assorted crap, even whole boxes full. I still haven't unpacked most of my junk from when I moved out of California in 1992. I probably should just throw it all away. I can start by throwing away this bag of assorted crap.